The Chart of expressions of time introduces grammatical expressions of time in the past, present, and future. The child can now integrate the mathematical concepts of units of time he has learned thus far with the use of correct linguistic expressions to be built into logical sentences with word labels. 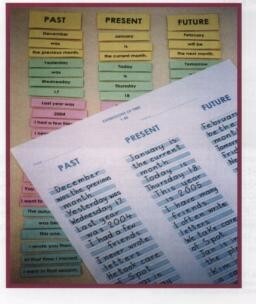 The sentences that represent time in the past are placed on the chart under the column with the heading “past”. The same will be done with those sentences that indicate the present and the future. When all the labels are organized into meaningful, sequential sentences, the teacher checks the child’s work before he/she copies the sentences on the chart. This work is suitable for students of kindergarten 7 years of age.